I’m not quite sure what I was expecting when I started reading What Was I Thinking? I’m guessing I was thinking I would read a book about mistakes, and then have solutions directly following those mistakes. That’s not exactly what Helmreich has created; his book is more of a sociological study of misbehavior, with long lists of why people do things they later regret, with only the tail end providing some solutions. For something that labels itself as a self-help book on the back, I don’t think it quite makes it; as a study on the mistakes we all make, however, it’s an interesting read. He then gives examples and explains how these aspects can create an environment that lends itself to doing dumb things. These chapters and their separate sections are interesting to read; Helmreich has a good writing style, and his examples and stories are interesting. What I’m not sure about is how this book all hangs together. One reason in one chapter seems an awful lot like another reason in another chapter a lot of the time, and, really, I don’t think we need to know much more than that there are some basic personality flaws or situations that can cause someone to do something dumb. I also had issues with the way the book is structured. I think it would have been much more effective if, at the end of a chapter, Helmreich provided some concrete solutions as to how to avoid or prevent committing that type of mistake. Instead, his suggestions are segregated in the last chapter, which doesn’t lend itself to easy reference. If I think my problem is arrogance, which is the second chapter, I have to go to the end of the book in order to look for guidance to help me overcome my personality flaw. I do, however, think that What Was I Thinking? makes an excellent study of human nature. We all make mistakes, and we make them for a variety of reasons. I enjoyed reading this book because it made an attempt to make sense of our dumb actions, which was something I thought, outside of cases of psychological pathology, was impossible. Helmreich has taken his sociological training and produced a book that is engrossing, just not for the reasons he was hoping for. On the whole, What Was I Thinking? is a good sociological study, but a so-so self-help book. I’d recommend it for curiosity, but not for actual advice. A Pocketful of History is a collection of essays about the state quarters put out during the fifty state quarter program. Some are straight history, some are about a particular coin design’s travel from idea to eventual winner, and some … some kind-of go off on tangents. When the coins give Noles something of historical importance, he does a good job of telling us the story. Unfortunately, not all do, and Noles has to scramble to deliver on his promise. A lot of the time, Noles is lucky. A state chose something of historical interest to base the design of their coin on, and he has a good topic to write about. This happens most frequently in the beginning of the book, which is organized by order in which the states joined the union, and thus has the oldest states closest to the start. One of the best examples of this is the very first chapter, which tells the story of Delaware’s coin design. It features Caesar Rodney in his gallop from Delaware to provide a critical vote for independence in the Continental Congress in Philadelphia. It’s a story I didn’t know, and Noles tells it well. I enjoyed learning that little bit of Delaware history that turned out to contribute to a fairly large part of American history. Another type of story Noles tells is the trip the winning design took to become the design a state chose for their coin. California’s chapter is a good example. Noles spends a lot of time on Schwarzenegger’s decision-making process before getting to the story of John Muir, who is featured on the coin. These chapters I found much less interesting than the ones that focus most of their attention on the story of the coin. I found myself bored when he discussed the process of design, the way the decision was made, the people who made the decision, the number of the coins, and whatever controversy there was about the design that was chosen. I didn’t expect to get that type of story. I’m interested in the story the coin is intended to tell, not that of the politics that brought them into being. The worst of the chapters go off on paths that are tenuously connected to the design of the coin. Perhaps the most egregious example of this type of chapter is that of my home state, Michigan. Noles starts off the chapter by titling it, rather insultingly, “Great Lakes, Great Drama … and a So-So Quarter”. I’ll admit that the design of the quarter is more simple — it’s the shape of our state (not the borders, since those extend out into the Great Lakes) as well as those of the Great Lakes. Instead of telling the story, then, of the formation of the lakes, or the history of the shipping industry, Noles chooses to tell us of the great storm of 1913 and the devastation wreaked on the ships sailing at the time. How, exactly, is this related to the image depicted on the coin? It doesn’t show a boat in distress. It doesn’t even show waves, and has little to do with Michigan itself. I was extremely disappointed in Noles’ treatment of my state. Fortunately, the good chapters outnumber the bad ones, which made A Pocketful of History much easier to get through. Noles would have done better to keep out of the politics, and find the more honest stories for the coins that didn’t readily provide a historical image for him to write about. I looked forward to reading Bellwether. I read Doomsday Book several years ago and really enjoyed it. As I soon found out, however, Bellwether, while it is an enjoyable story, can’t be compared to Doomsday Book. Their stories are too different and Connie Willis’ goals for the two books are far away from one another. Still, Bellwether was a good way to spend a couple days; it’s a smart book with a clever plot and interesting characters. Bellwether has a rather fun premise — a sociologist studying fads forms an unlikely partnership with a man studying chaos theory, and end up doing their study with a flock of sheep. Sandra, our sociologist, is studying the fad of hair bobbing in the 1920s. She works at HiTek, a science company — it literally has taken scientists from all fields, put them in one building, and now treats them like office workers. There’s more pointless rules and hoops to jump through than any sane person should put up with. Since they’re treated like office workers, they’re expected to fill in forms with the best of them. When Bennett, our hapless chaos theorist, loses his funding forms (by turning them in to the person he was supposed to), he also loses out on his macaque money. Sandra, who has developed an interest in Bennett due to his complete immunity to any and all fads, offers a unique solution — share funding by studying the movements of sheep — they’re less complex and easy to track for Bennett and are creatures who like to follow others for Sandra. Mixed into this is the Niebnitz grant, an astronomical sum awarded to scientists considered to be doing work above and beyond their colleagues. HiTek is determined to have a winner among their scientists, even if it means studying the past Niebnitz winners and manufacturing projects that match the pattern. The most enjoyable part of this book is the interplay between Sandra and her employer, her coworkers, and the outside world. She studies fads for a living, but she’s not exempt from having to experience them in real life. The management always has new procedures (with a new acronym). Flip, the irresponsible mail girl, constantly surprises Sandra with something new she’s wearing, saying, or doing. Trends in food come and go, much to Sandra’s chagrin; she just wants chocolate cheesecake and iced tea. There are, however, some problems with the book. It feels a little slap-dash. Maybe part of that is its length — it’s only 247 pages. There is also a feeling of disconnection, to a certain extent. Sandra’s job is fads, something that is inherently human, but it seems as if they are something she detests in personal life. She appears to feel as if she’s above others, which is a little uncomfortable to read. It’s not so great when the hero of the book thinks that most people are dumb. Bellwether also contains what appears to be an obligatory romance between Bennett and Sandra. It is particularly irritating to me because their behavior so clearly indicates their feelings, but those feelings aren’t acknowledged in the book until pretty close to the end. Other than those couple of things, Bellwether is a perfectly pleasant read. It was a fine way to spend my reading time for a couple of days, but I don’t think the story will stay with me for a long time. Historical fiction tends to fall into two categories — adventure and romance. As indicated by its title, The Virgin Widow firmly falls into the latter category. It doesn’t disappoint in that area, and actually surprises the reader with an English-based historical romance that doesn’t take place in and around the reign of Henry VIII. The author, Anne O’Brien, also appears to have done her research and written a book that feels true to the times. The best thing about this book is the setting. I don’t know a whole lot about the War of the Roses. It was great to read a book that takes place during the power struggle between the families of York and Lancaster. It starts off with Anne and her family, the Nevilles, on a boat from England to Calais, with Anne’s sister, Isabel, in labor. Anne’s father, the Earl of Warwick, was adviser to the Edward IV, the King of England, but the two have had a falling out over the Queen, Elizabeth, and the amount of influence she has over the King’s decisions. The plot of the book goes on to follow some of the events of the war, which, to me, is great. I can learn while I read? Fantastic! I also think that Anne is an admirable character, for the most part. She is smart and spirited, and, since the book is in first person, we get to follow her thought processes. I suppose this is probably standard for romance novels; being in the person’s shoes allows for a more complete fantasy. I still liked it. O’Brien gives Anne’s story a nonlinear structure to discuss Anne’s childhood, which is also nice. I liked the excitement of the opening chapter with the quiet storytelling of the next couple. It wasn’t an obtrusive way of making a book both grab the reader and tell the character’s story fully. The Virgin Widow does, however, have a couple of flaws. The first is how Anne, for such a strong girl and, later, woman, comes to believe she has to rely on a man to protect her. I’m guessing this is part of the romance, but I found it off-putting. Why on Earth would a widow, an independent person with her own rights, have to stay in a household with a man in it, for example? She shouldn’t need safe-keeping. This bothered me quite a bit. I don’t know how O’Brien justified Anne’s passivity with regards to her decision-making and personal safety, but I didn’t care for it. My other issue is with the writing itself. I’ve rarely seen so many ellipses in a book. It was a bit distracting. Not everything a woman says has something else implied at the end or is a half-finished thought. The men usually get full sentences; why don’t the women, too? Overall, I think that The Virgin Widow is a historically-accurate romance, which counts for a lot. I’d like to see a more forward woman in Anne when it comes to men, since she’s bold in other ways, and a bit more polish on the dialogue. Other than that, it’s a fine light read. I am extremely interested in how the brain works. After I graduated with my bachelor’s degree and before starting my master’s (in fields unrelated to brain function), I worked for a professor examining fMRI scans, which piqued an already healthy interest in the brain and mind. Almost everything written on the topic for a lay audience will eventually end up in my hands. Synaptic Self seemed especially interesting to me — who doesn’t want to know how the brain creates the self? It’s one of the fundamental questions of life. Unfortunately, I got to this book about seven years too late. The science in Synaptic Self is engrossing and amazingly complete. Joseph LeDoux walks the reader through the physical set-up of neurons, how they communicate with one another (both individually and en masse), and how genes and behavior alter the pathways our brain cells make. LeDoux doesn’t dumb down the science, which is awesome. It also could easily become confusing. For example, many of the diagrams in the book include abbreviations that don’t really make sense. In one case, when explaining the roles the amygdala and the hippocampus play in stress, the caption text calls cortisol “CORT”. Not a huge deal, but, first of all, why did the word need abbreviation, and second of all, why would you bother if the actual diagram uses “cortisol” in every instance of its use? There were many occasions where I had to go back and reread a part to make sure I got what he was saying. I don’t really feel like the book got to a point where I could relate to what LeDoux was expressing until he got to the section on people with mental disorders — schizophrenia, depression, and anxiety disorders. I’ve had experience with those, I’ve done research on them, and learning about how scientists used the information he tells us about in the previous chapters to develop understanding and, from that, treatments, was fantastic. I didn’t mind the rehash because he told the story well. I’m also not convinced he makes his point in the best way. I got his main idea, but felt let down, to a certain extent. Our selves are made of the connections our brain cells make between each other. They use genes to know where to go, vaguely, and then use input from the environment to learn where to go, specifically. Varied tasks, interwoven, make us react in certain ways. A lot of what we do is hidden from conscious experience. And … that’s us. This is the crux of my dissatisfaction: I’ve heard most of this before. I went through psychology courses in the early to mid 2000’s, and, yeah, I learned that aspects of personality are not all genes and not all environment. I get that genes set you up with tendencies, and that your experiences influence how your individual brain ends up working. All the content of this book is stuff most people who are interested in the topic will have already heard from other sources a long time ago. This isn’t really LeDoux’s fault. He wrote the book in 2002, when research in this field was relatively new. And, for a book that was near the ground-level of a new point of understanding the brain and the self, it’s pretty good. I just wish it had been a little more approachable and that I had reached it earlier. Washington, D.C., might be America’s political capital, and L.A. is the modern source of a lot of our shared cultural experiences, but to examine the true heart and soul of the United States, one has to look to its largest city. Edward Rutherfurd provides an opportunity to do just that with his aptly, if slightly uncreatively, titled novel, New York. Toward the end of the novel, Rutherfurd mentions James Michener a couple of times in passing, most likely for the time-sensitive cultural clue. It’s also, however, an amazingly appropriate choice for Rutherfurd to make. This book is a sprawling, grand examination of a city through time since its creation by the Dutch in the seventeenth century, following in the same vein as Michener’s work, mixing the fictional and nonfictional together in a closely-researched and very accurate novel. This is, unfortunately, one of the aspects of the book that made it a bit of a chore to read. Rutherfurd has a wealth of engaging stories in the Master family, the one clan we get to follow from the beginning of New York until the present day. Even most of the side stories are interesting. There’s simply too much. While the plots are good and the characters are, for the most part, believable, there’s a lot to keep track of and, quite frankly, the story seems to stall in certain time periods. Most of the Revolutionary period, as well as the time around the Civil War, comes to a standstill. A reason things tend to go slowly is the painstaking way the city’s history is presented. It often feels like the actual story grinds to a halt so Rutherfurd can provide the reader with a history lesson. A little bit of this is good. A lot of this makes the story feel as if it’s there merely to teach us what we should have learned in high school history class, which gets old fast. I found it difficult to get through at times because I felt it was a slog to get to the story through the education attempt. On the plus side, I really liked following the one family and seeing its fate (and the fates of those surrounding them) unfold. It’s an excellent device for mirroring and exploring how historical events affect both individuals and following generations. I was sorry to see that we lost families along the way; I would have liked to been able to see an African-American storyline throughout the entire book, for example. I feel that Rutherfurd was extremely honest about what people’s reactions to their current events and situations. Most Northerners were, for the most part, complicit about slavery, and he gives us a full view of people passively and indirectly earning money off the forced labor of African slaves. We see many in the Master family show their greed, their vanity, their generosity, their idealism, and their malaise in incredibly accurate prose. Rutherfurd has an amazing understanding of people’s inner motivations, and I enjoyed being able to see inside so many interesting minds to explore their thoughts. Overall, New York is a series of wonderful stories strung together by exposition that can drag. If you don’t know the history of New York, or American history, the background is probably helpful. For those of us who have a grasp on what this country — and what its landmark city — has been through, a lot of the book can be jettisoned. I love words. I love reading about words. I have a favorite linguist (John McWhorter, for those who are interested), and never turn down a book that discusses language, whether it be English or a foreign one. 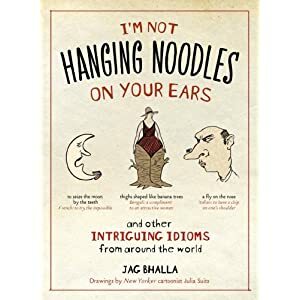 Thus I was heartily excited to read I’m Not Hanging Noodles On Your Ears. He provides us with a plethora of idioms, most of which are delightfully descriptive. Some are not so far from those used in English. For example, in Hindi, you say you have “stomach fire,” when in English you would say you have “heartburn.” Not so odd. Others are completely incomprehensible to the English speaker, like when someone “looks like September” in Russia, they look sad. I found the variety at turns comforting, surprising, and chuckle-worthy. So, yes, the book is charming. It did have a couple of negative points. The first was the narration Bhalla gives us before the lists of idioms. Yes, he likes his topic, but the exposition is a little too in-your-face with cheekiness. Especially annoying to me was the use of italics to point out English idioms within his little introductions. It was distracting to me to have them pointed out, no matter how much Bhalla was trying to show how idioms become a staple of any language. Another issue I had with the book is that one idiom might be included two or three times. Often he will have talked about the idiom in an introduction to a chapter, then included it in a list within that chapter, and then later included in a separate chapter. This is what happened with the Italian idiom, “to reheat cabbage,” which means to rekindle an old flame. It is mentioned in the introduction of the chapter about love, then in the list within that chapter of “Other Romance-Related Idioms.” Imagine my surprise when I also found it in the introduction to the chapter about food. It is as if he either cannot remember he has mentioned it before, or that his reader is dim-witted. Those problems are not negligible. They are, however, outweighed by the enjoyable aspects of the book. I’d recommend it for those who have an interest in language, but probably isn’t for someone who will be aggravated by the repetition or the boisterousness of the author.